Our Mung Bean Sprouts are produced in compliance with USDA safety guidelines and harvested when they naturally reach maturity. 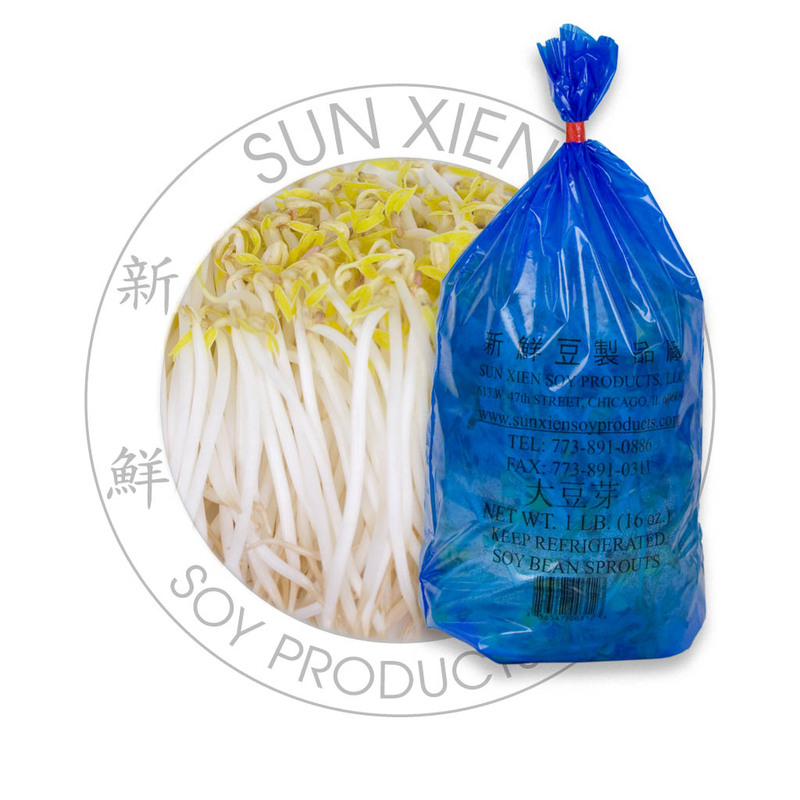 Mung Bean Sprouts are characterized by a stem similar to to the Soy Bean Sprout but without its yellow head. Large majority of south Asian cuisine tend to use Mung Bean Sprouts over Soy Bean Sprouts. Care: Keep refrigerated and use soon upon purchase. Our Soy Bean Sprouts are produced in compliance with USDA safety guidelines and harvested when they naturally reach maturity. 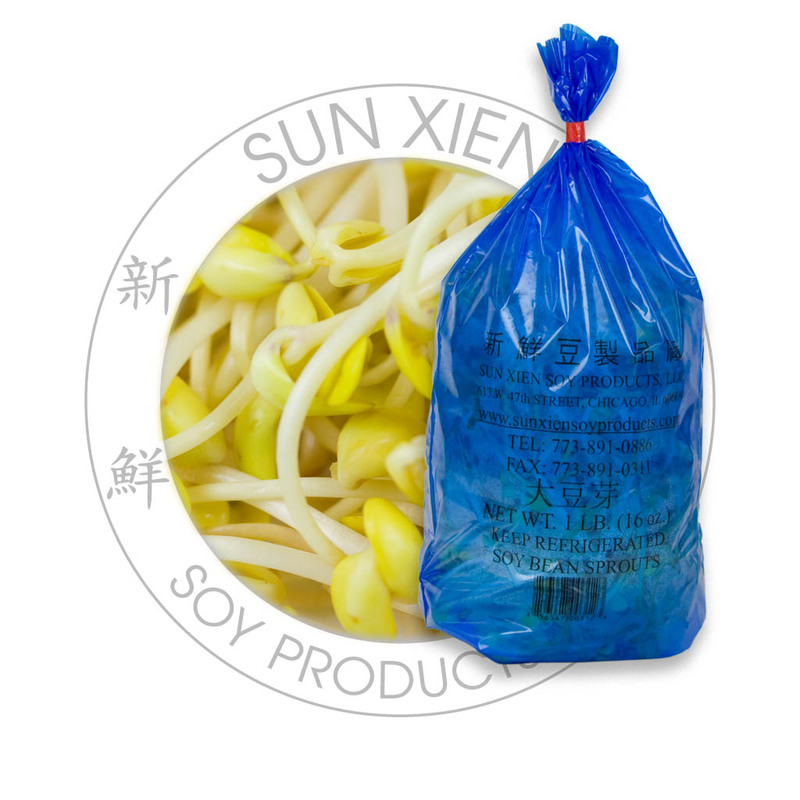 Soy Bean sprouts are characterized by the intact yellow head that provides an additional vegetable crunch especially when stir-fried. Soybean Drink also often called Soymilk constains soybeans and water. This is a non-dairy product and suitable for those who are lactose-intolerant or simply seeking a refreshing plant-based alternative beverage. 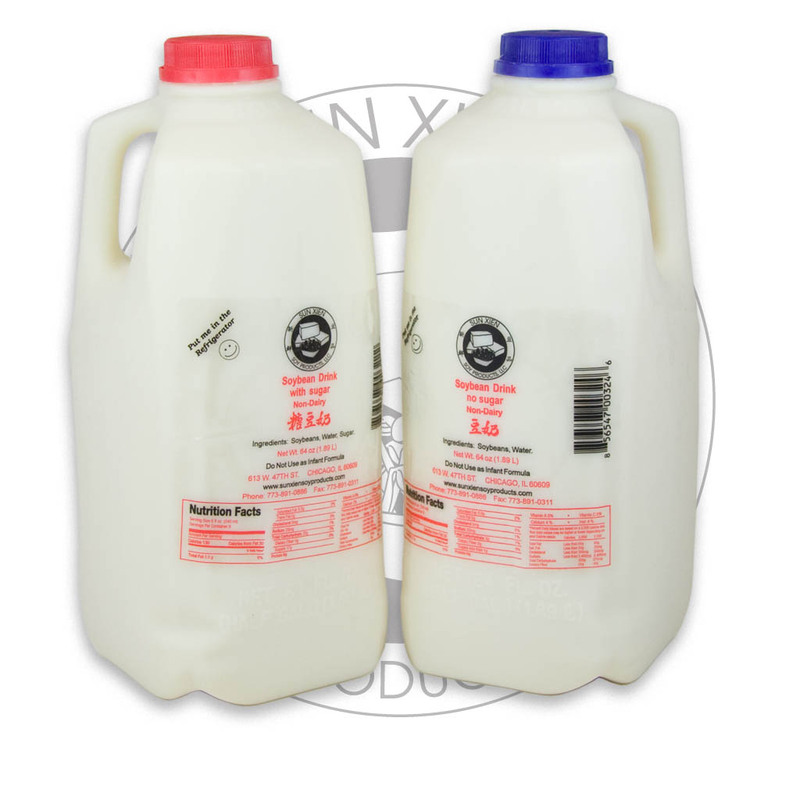 Our larger half-gallon (64 oz, 1.8Kg) version is available sweetened (red cap) or unsweetened (blue cap). Care: Keep refrigerated and consume soon upon purchase. Soybean Drink also often called Soymilk contains soybeans and water. This is a non-dairy product and suitable for those who are lactose-intolerant or simply seeking a refreshing plant-based alternative beverage. Our individual-sized 16 oz version has been slightly sweetened. Care: Keep refrigerated and consume as soon as possible upon purchase. A firm tofu that’s been seasoned with a bit of salt and Chinese five-spice. This provides a ready and convenient tofu that can immediately be julienned into stir-fried vegetables to provide a meatless protein option. Care: Keep refrigerated and use as soon as possible upon purchase. Similar in almost every way to our rectangular Fried Tofu, but just a change in shape for those that need a triangular presentation. Fried in pure vegetable oil. 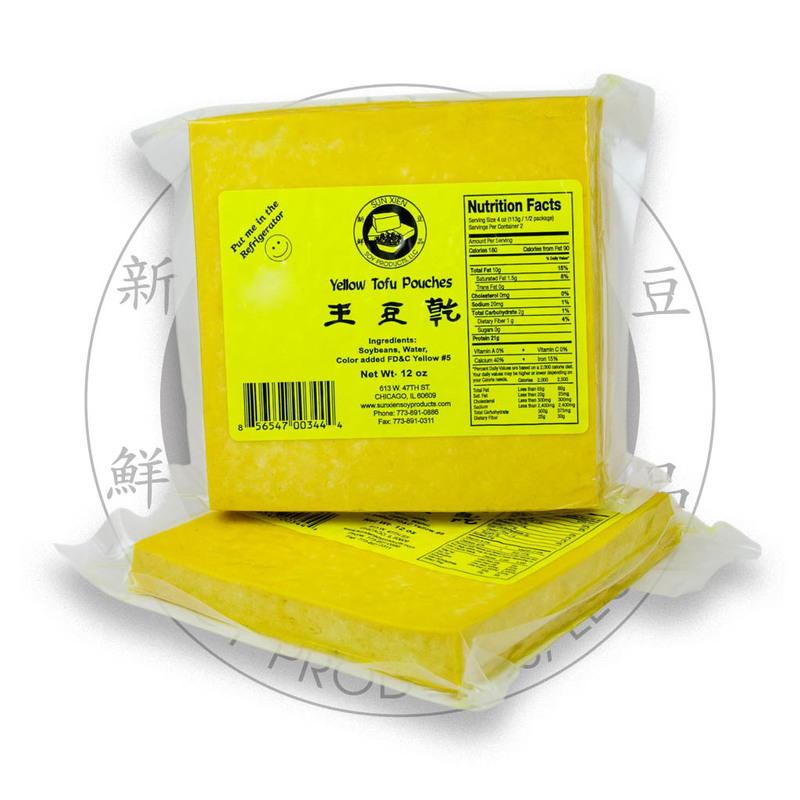 Yellow Tofu contains a hint of turmeric spice along with some coloring to exhibit a hue for certain traditional dishes that call for it. White Tofu is a notch more firm than our typical Firm Tofu. 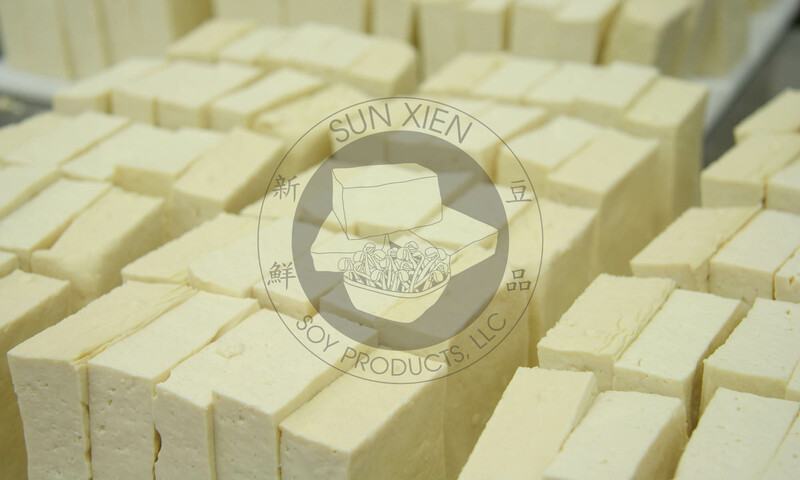 White Tofu undergoes extended pressing and is vacuum-packed without the Firm Tofu’s water bath container. 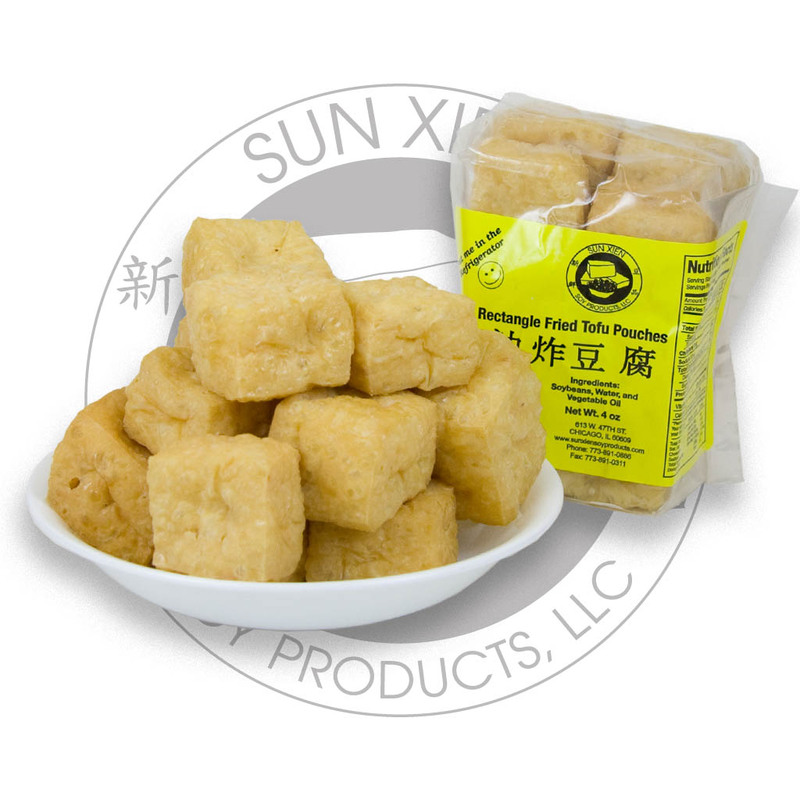 Immediately after crafting our fresh Firm Tofu, it is cut into long cubes and deep fried. 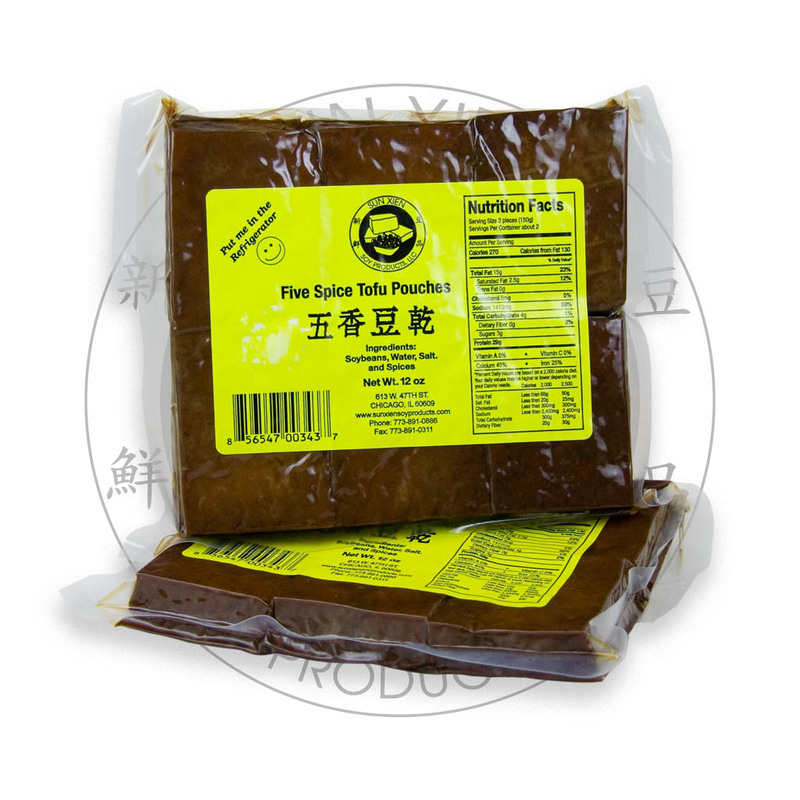 This results in our Fried Tofu that features an outer skin making it a great alternative or harmonious accompaniment to fried fish cakes when sliced into a bowl of ramen or stew. 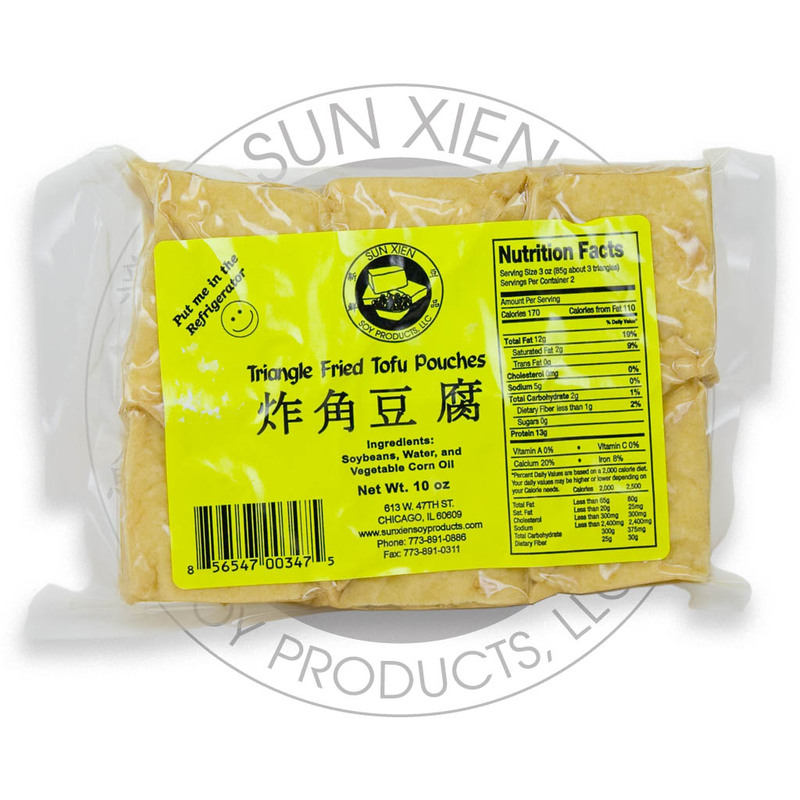 With its outer fried shell and airy core, Tofu Pouches demonstrate the marvelous ranges of texture Tofu can achieve. Tofu Pouches added to a savory stew or Chinese hotpot provides additional dimension while its spongy center captures much of that delicious sauce or soup. 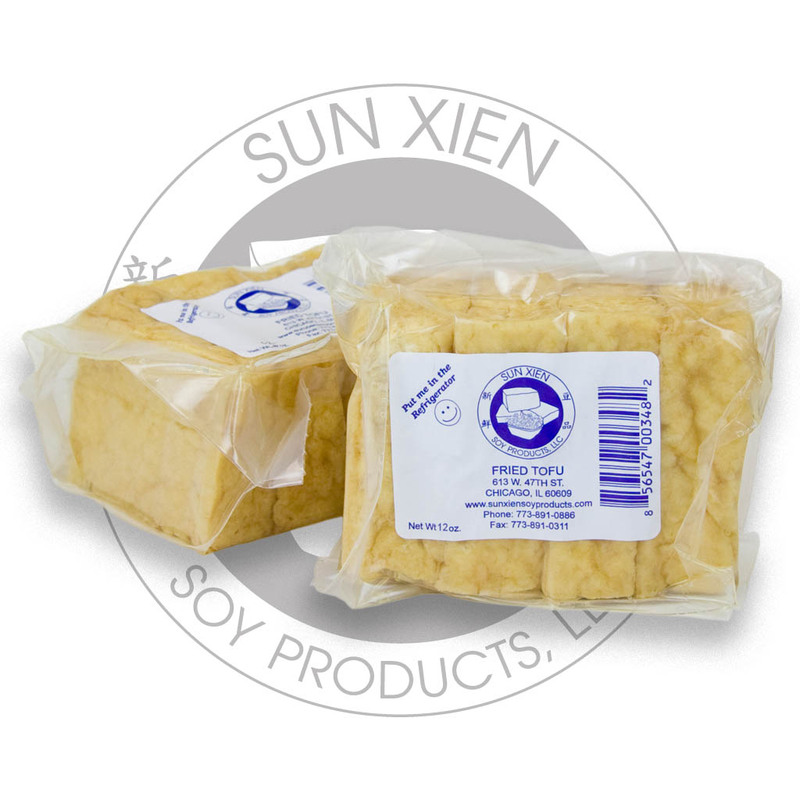 Interested in Sourcing Sun Xien Soy Products for your Business? 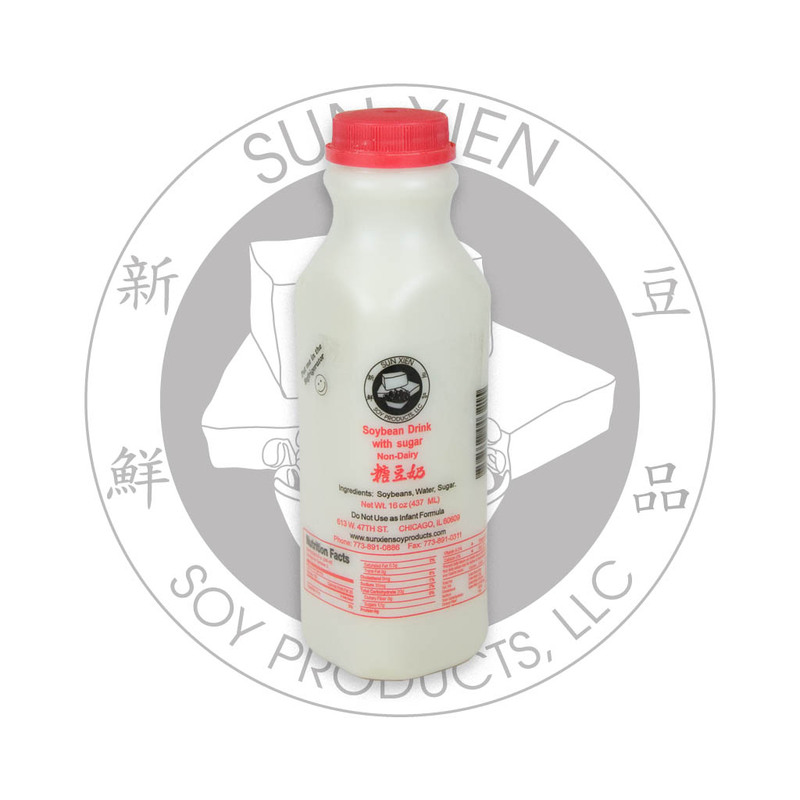 Sun Xien’s mission is to provide premium soy products throughout the Chicago region. Copyright 2017. 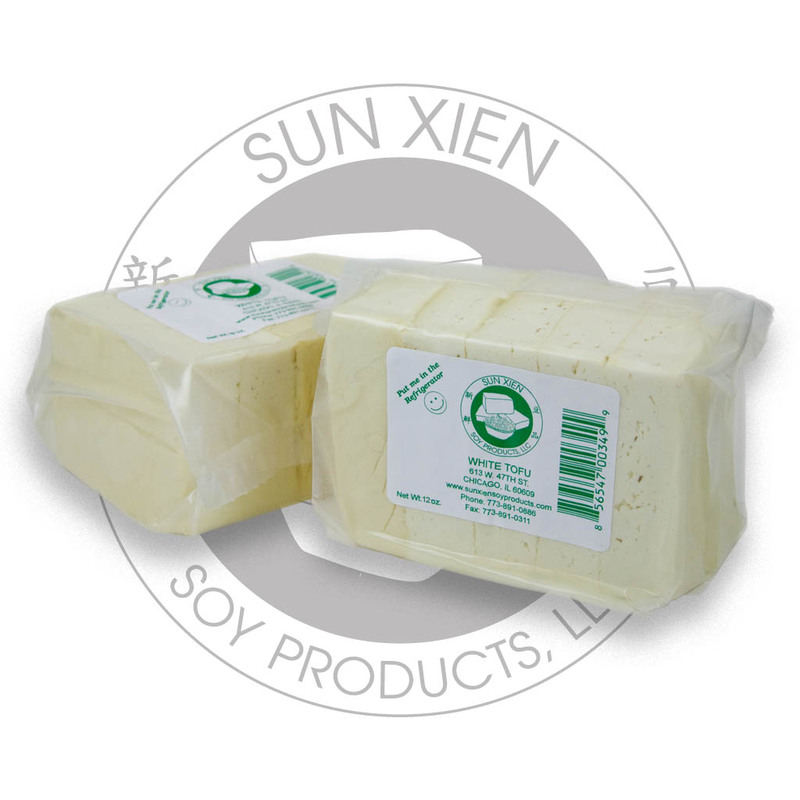 Sun Xien Soy Products, LLC. All rights reserved.